A few weeks ago I shared with you some of the great casual restaurants that Alex and I dined at during our recent trip to Bonita Springs, Florida. Today, we are still in Bonita but switching gears to dinner. These two options are great higher end options for when you want to switch it up at dinner from the more casual fish shack at lunchtime. If you're in the mood for a good bowl of pasta or a nice steak, Angelina's is a great option. It's part fine dining and part old school Italian with a menu of inventive interpretations of traditional Italian dishes. Angelina's features a really impressive wine list, a sommelier on staff, and servers that are incredibly well versed in all of the menu offerings. We also appreciate a restaurant where the servers begin the conversation by asking about food allergies as that one question stopped Alex from eating an amuse bouche including pine nuts that could have ruined the rest of his vacation! 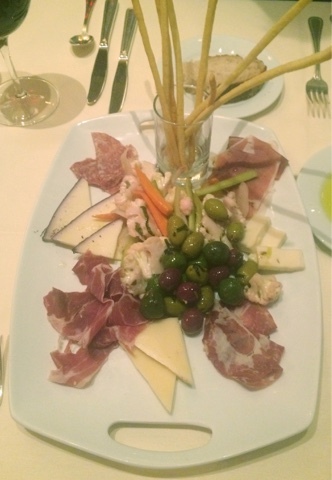 After I enjoyed my amuse, we started our meal by sharing Angelina's house antipasti board. The board included a generous spread of charcuterie, selection of cheeses, assorted olives, crispy breadsticks, and the most delicious house pickled giardinera. It was a great variety of elements and would have absolutely been enough for 4 people to have shared prior to a meal as well. 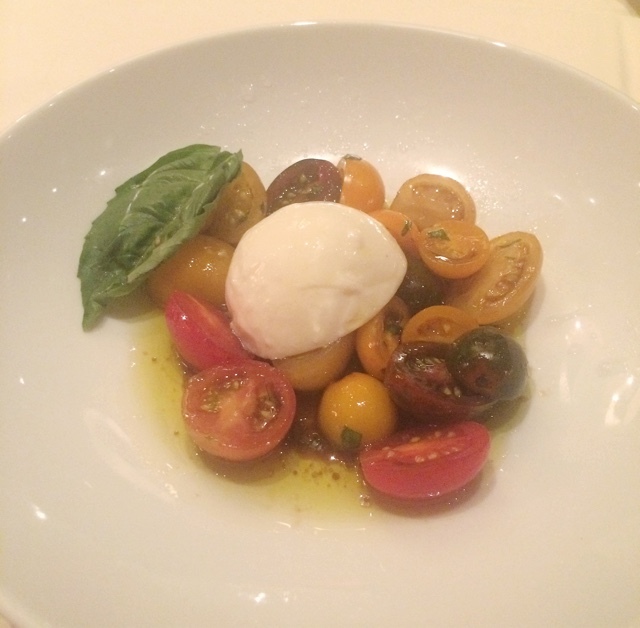 We also decided to share a caprese salad before our meal. The chefs split the salad for us, so this photo depicts a half portion of the salad. I loved that they used sweet heirloom cherry tomatoes in this salad, which makes it look (and taste) so much brighter. They were lightly marinated in a combination of olive oil, balsamic vinegar, and garlic, served with creamy fresh mozzarella and a sweet basil leaf. This salad is classic and simple and always a favorite. Alex and I both ordered off the pasta menu for our entrees. Butternut squash is one of my 'go to' ingredients and I especially love a butternut squash ravioli, so when the server recommended that as one of Angelina's signature dishes I was sold. It was rich and delicious and this restaurant's preparation was a little different from the norm, which I also loved. 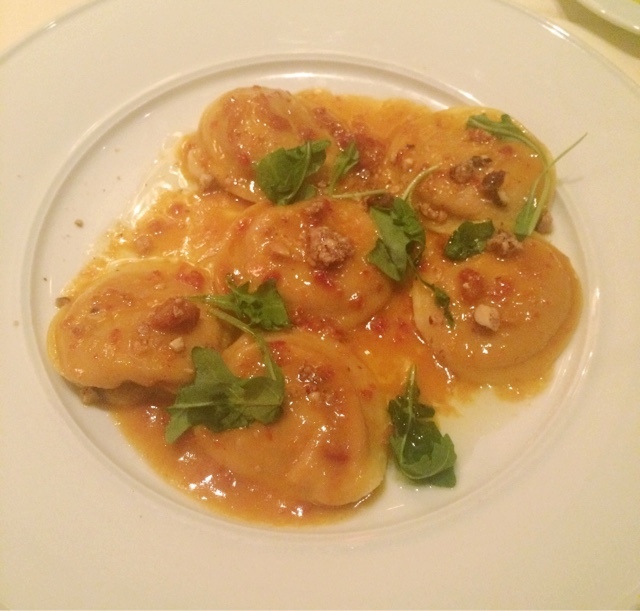 Generously stuffed handmade ravioli were tossed in a sweet tomato citrus butter with a touch of truffle oil, toasted chopped almonds and a few fresh arugula leaves. I was a bit skeptical of the citrus tomato butter and squash combo, but I have to say that it was delicious and that acidic sweet flavor along with the rich butter base worked so nicely with the creamy squash filling of the pasta. I'd absolutely have it again! 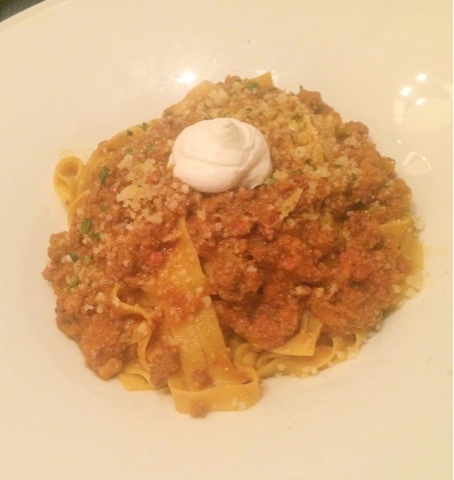 Alex ordered the tagliatelle Bolognese, a combo of one of his favorite pasta sauces and (in my humble opinion) one of the best pasta shapes: thick pasta ribbons, perfectly suited for a hearty meat sauce. This rich meat ragu was topped with a dollop of herbed ricotta and a sprinkle of fresh herbs and grated Parmesan, adding even more richness to one of the heartiest pastas on the menu. Angelina's is a wonderful spot for a special occasion or a date night-- or for when you're just really in the mood for a glass of wine and some really solid Italian food! Alex and I celebrated our fourth wedding anniversary the night before our trip to Bonita Springs, so while this visit was mostly to attend a friend's wedding it also worked nicely as a little anniversary getaway. And since we honeymooned in Hawaii, it seemed only appropriate to spend an evening out at Roy's Hawaiian Fusion while on our vacation. And having recently visited the Roy's in Chicago, I knew we were in for a great meal! We started by sharing the Canoe Appetizer for Two, which was a perfect was to sample several of Roy's signature starters and also reminded me of this goofy song from Glee. 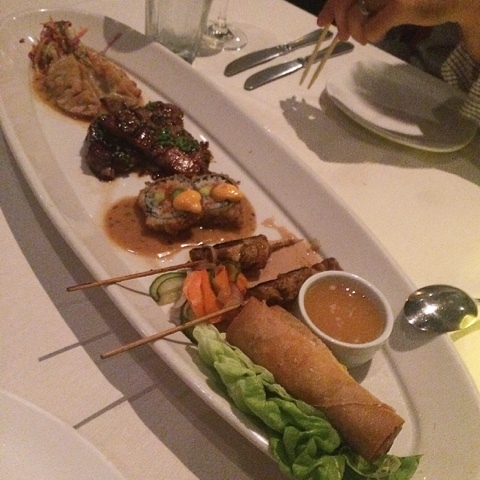 The canoe features a delicious variety of appetizers including the Szechuan ribs, spicy tuna roll, lobster potstickers, Malaysian chicken skewers, and vegetable spring rolls. Everything was delicious and we pretty much cleaned out this platter between the two of us, but I have to say that the potstickers served with spicy Togarashi miso butter sauce and slaw and the spicy tuna rolls were definitely two of the highlights for me. When it came to ordering entrees, I recalled that one of my favorite dishes from our time in Hawaii was the macadamia nut-crusted Mahi Mahi. I ordered Roy's version, which was served with a rich lobster cream sauce. The Mahi was perfectly cooked and tender and the buttery macadamia crust was absolutely delicious. 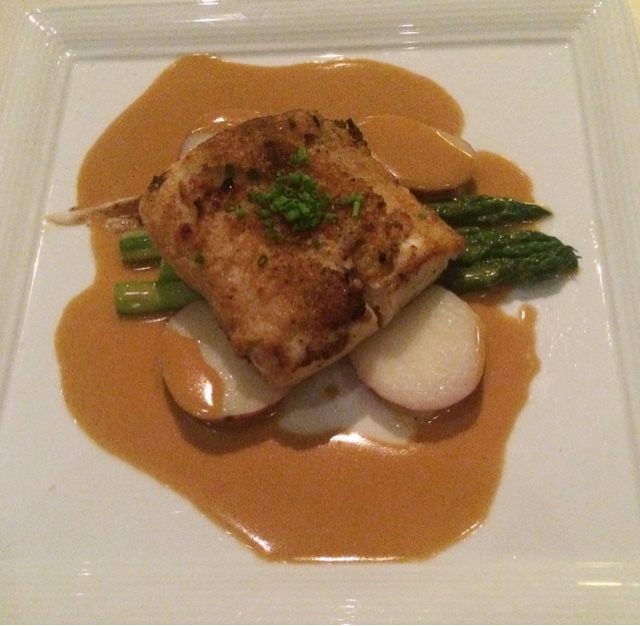 The fish was served with a few tender slices of redskin potatoes and crisp asparagus spears. It's a wonderful dish and a signature on the menus of many Roy's restaurants around the country. Alex ordered the seared sea scallops, which were a generous size and perfectly seared on the outside while still tender on the inside. 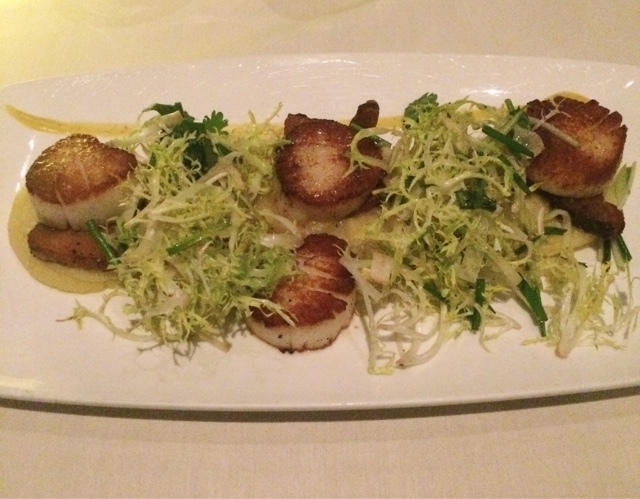 These sweet scallops were paired with rich and savory pork belly atop a creamy potato puree with crisp fennel and apple. The entire dish was nicely complemented by a sweet spiced honey coriander glaze. This dish tasted like fall and was a wonderful combination of flavors and textures. 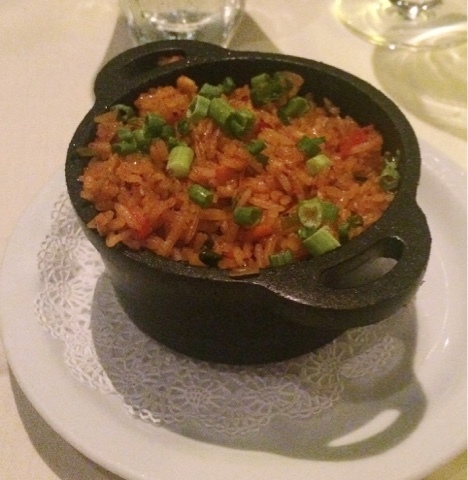 We opted to share a side of the lump crab fried rice along with our entrees. With flavors of garlic, ginger, and sesame, this fried rice had a nice touch of sweetness from the crab. This little portion was perfect to share along with our sizable entrees. We finished our meal with a dessert that many of my foodie friends have raved about at Roy's: their signature melting hot chocolate souffle. It takes a while to prepare, so you need to order it earlier in your meal to give the kitchen ample time to bake it. But since we had heard so many wonderful things about this dessert, we knew to save some room for it... and it was worth it! This flourless chocolate cake is filled with a molten chocolate center and while small, is so rich that it's a perfect dish to share. 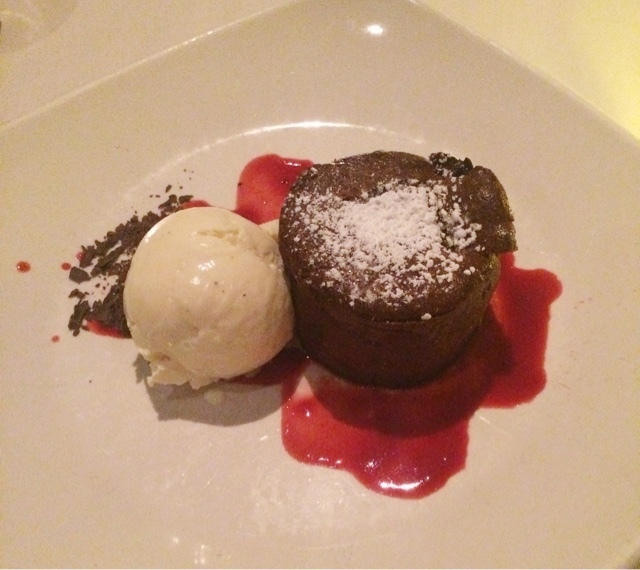 The souffle cake is amazing on its own, but paired with a scoop of vanilla bean ice cream and a sweet raspberry coulis, this is pretty much the perfect dessert. Order it early, save room, and enjoy!